The latest slice of Retro F1 is on its way. It'll take place this Sunday, 27 November at 1500 (3pm) GMT and we'll be watching 1986 Spanish Grand Prix. For those of you who don't know, Retro F1 is when we watch on old F1 race in full on YouTube, and post updates on it on Twitter as if the race is live. It will be great if you can watch along with us and indulge in a bit of Twitter chat as we go. If you're anything like me, watching old F1 races is a real treat, and it'll be good to share thoughts through the race. The race will feature Senna, Prost, Mansell and others, as well as the 1980s turbocharged F1 monsters, so it will be worth a watch! I also put a write up of the Twitter chat on my blog after the event. 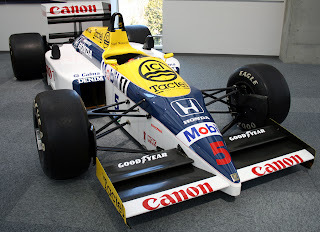 Those for the first two Retro F1 events can be read here and here. You can follow the chat with the #retrof1 hashtag here, and the link I'll be using to watch the race is here. As I said, I'll be delighted if you can join in. It will be good fun. Please let me know any questions or comments you have via the comments below or on Twitter. I'm also happy to hear requests for future Retro F1 races to watch, though bear in mind it needs to exist in full (and for free) on the internet. Hey, its a great idea. As I said going to try and make it, but its 2am Australian time. Have a suggestion, just doubt it will be on youtube, but awesome if it is. 1982 Monanco GP. How good would the twitter feed be in the last 3 laps!! Thanks very much both, glad you'll be watching. I'm not sure Andrew if 1982 Monaco GP is on YouTube, I will take a look though. It would be a fascinating one to do as you say! Sorry also on the start time. It's very difficult to pick a time that suits everyone, unfortunately! no Piquet ? ? ? not at all ? ? ? ask them if you do not believe me.